#1 Find a board certified plastic surgeon who produces a facelift result that you find pleasing and natural looking. #2 Define the goals you have for your face (i.e. the areas you want improved, state your concerns) eyelids, jowls, sagging neck, aged or sun damaged skin, droopy mid face, thin lips etc. #3 Consider pre-operative skin care to improve your end results. #4 Realize you cannot get surgical results from non-surgical treatment. I don’t care what they promise; you cannot get the total outcome of a facelift without surgical intervention. #5 Be willing to take the advice of the Plastic Surgeon you have chosen. He/she may be able to identify alternative treatments and put together a plan for comprehensive facial rejuvenation. More than once I have had a patient come for a consultation and tell me exactly what surgery she thought would fix her problem. This is a good starting point but during our visit I was able to help her define her goals, evaluate her features and come up with a much better treatment plan. After all, the MD after my name does stand for “Me Doctor” haha. So how do you know when it is time for a facelift? Most of my patients tell me “I want to look like a fresher, younger version of me.” Well, there is no magic answer to how old you have to be to get a facelift. Whenever you look in the mirror and features on your face have started to age (droop, sag) and you don’t like it, then get it fixed! Some women do it all at once; face, eyelids, neck, brow lift, jowls, deflated mid-face and skin tightening. Others choose to take it in stages doing their eye lids at 35, their neck at 45, their jowls in their 50’s etc. That way the changes are subtler and a bit more like aging gracefully. Only your plastic surgeon has to know you cheated! The second most frequently asked question I get is “What is the recover time?” Usually by the end of two weeks you can go to the grocery store, at night, wearing sunglasses but probably not back in social setting for three weeks (that is if you care what others think). If you are the mother of the bride/groom, please have your surgery at least three months in advance of the wedding! 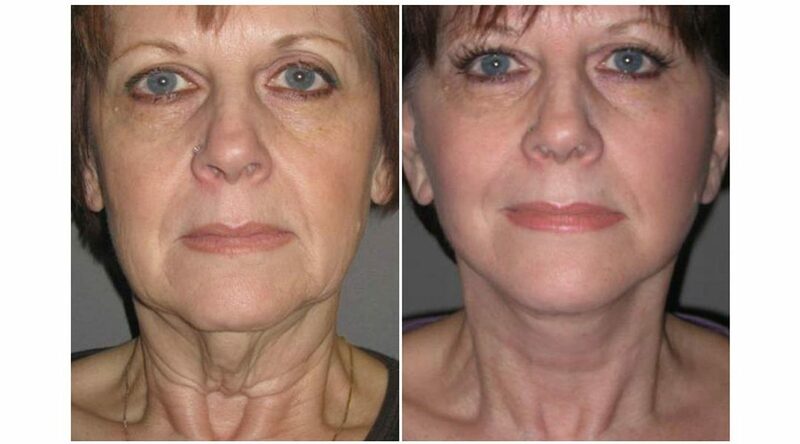 What is included in a facelift?Correction of the neck and lower face/jowls deformity is a standard facelift. Patients may also choose to rejuvenate their eyelids, brow, circumoral lines and facial deflation as additional procedures. Is tight facial skin always the right look? I consider myself like a carpet stretcher.If you still have worn, harvest gold, sculpted shag carpet just because I stretch it tighter is not going to make it look any better, just less lumpy. So, the first thing to do is fix the worn spots with professional grade skin care, peels and microdermabrasion. Next volume restoration (dermal fillers or fat grafting) is key to a more youthful face, i.e. more up to date carpet.